I have a dear, small, Scandinavian friend who, like me, loves food. This friend has survived a life-altering, direction-changing year, culminating in a decision to leave London in favour of her Tokyo-based love, going via Denmark to enjoy some quality family time. Needless to say, she couldn’t possibly leave the country without first dining with me, not least because such a large part of our friendship exists thanks to passionate discussions about FOOD. 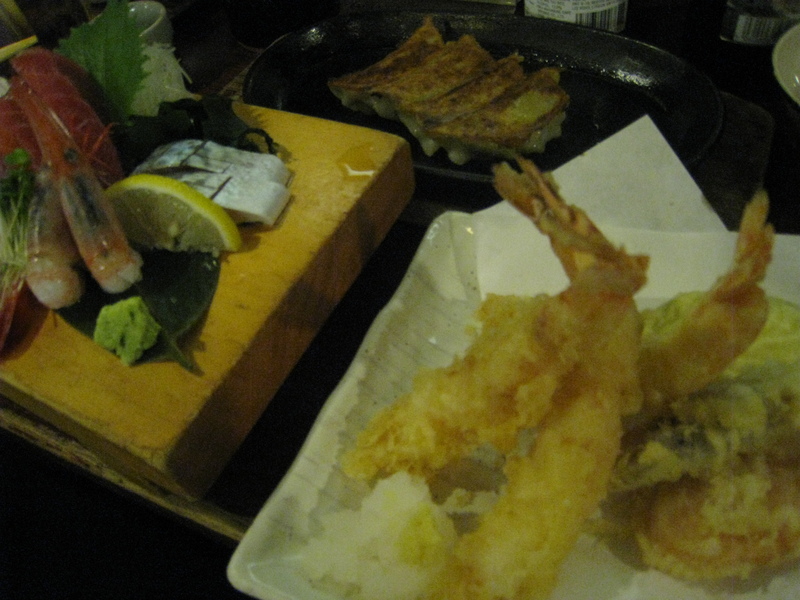 The Tokyo Boy had recommended for us a little tavern-style Japanese place on Goodge Street. I googled it and the first review I read scared me. A Japanese person had written it, slating the staff and taking no prisoners about their surly attitude to white patrons. No no no, we couldn’t risk it, could we? Not on our last dinner together for some time. Scandi-La was resolute, however. Tokyo Boy liked it and so would we. In the wake of her culinary courage, I followed her lead and we went to Yoisho. On entering this modest little restaurant, it’s obvious that this place is run by Japanese, for Japanese, with Japanese businessmen dotted around the place sipping on sake with loosened ties. 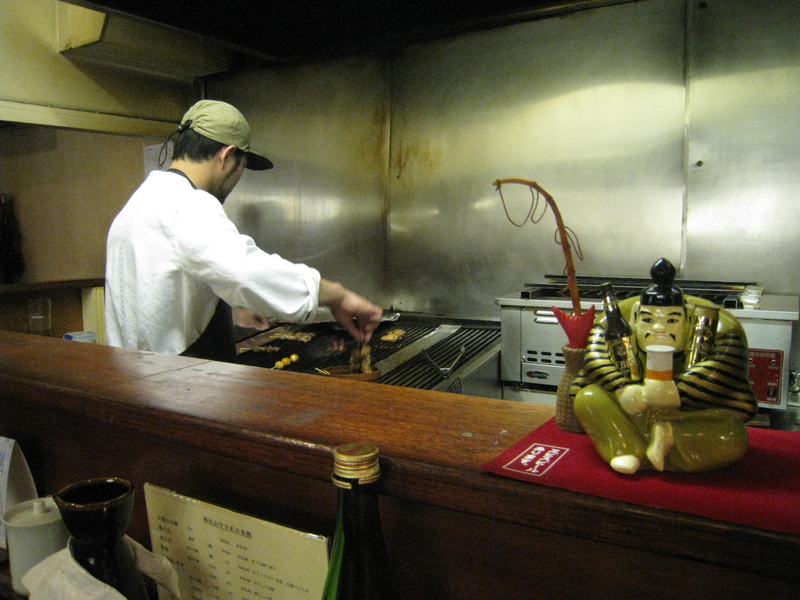 We sat at the counter overlooking the grill chef’s work and immediately ordered bottles of Asahi dry and some warm sake. We had two waitresses, both of whom were perfectly professional towards us (no gaijin phobia there) and one of whom bore a fantastic short haircut of some style and geometric precision. Behind the counter the grill chef worked tirelessly, smiling at us and nodding shyly from time to time. Scandi-La and I felt not one hint of hostility towards us, although our enthusiasm for Japanese food and a few words of Japanese definitely did not go astray. 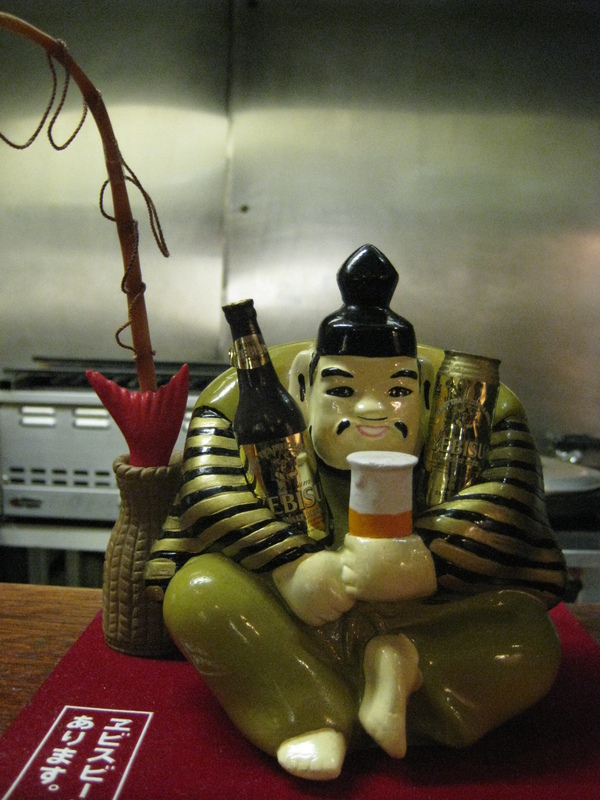 On the counter stood a lucky cat with waving paw and a figurine of a beer-hugging fisherman replete with fish and rod. The decor was hardly inspired, but felt refreshingly authentic in its tattiness, as if we’d walked off an Osaka street instead of a street in a wet and crowded pre-Christmas London. As usual, we struggled to decide on our food but eventually settled on gyoza (dumplings), a mixed sashimi platter, another of tempura followed by eggplant with miso – one of my all-time favourite Japanese recipes. Added to this was a selection of chicken skewers – some kebab-style; others mulched into grillable balls. The gyoza were exactly as they should be: light, soft and tasty with that hint of Japanese chive, but it was the sashimi that stole the first part of the Yoi-show. In a more favourable review of this eatery, someone had written that the sashimi was so fresh that there must be an ocean in the basement. This praise was not an exaggeration of the quality of the fish we were served. Scandi-La and I hummed with a united appreciation of the yellow-fin tuna, salmon and some sort of delicate white fish – all absolutely fresh and almost creamy as each morsel dissolved altogether too quickly against my palate, with barely the need to chew, but the star of the sashimi platter had to be the prawns. Previously to dining at Yoisho, I’d never eaten sashimi prawns. These were served vaguely blue, ready to pop out of the pink prawn shell, and my word, how they tasted as they slipped around my mouth! Suddenly I wished myself a pelican so I could eat such things all day. The mixed tempura, a heap of gilded king prawns and vegetable pieces, was almost fluffy, so perfect was the golden batter. And when we moved onto the eggplant with miso, I was ascending to eggplant heaven. The eggplant flesh was steaming and soft and slushy beneath the generous layer of miso – which both sweetens and salts the hot fruit beneath. We dug our chopsticks into the flesh, careful to load them with both eggplant and sauce, humming with yet more gastronomic delight. At some point in proceedings I ventured down the modest staircase to the ladies’ room, tucked away down a corridor in the basement. En route I discovered another dining room, filled with more Japanese people enjoying some post-work down-time. The ladies’ facilities were scruffy, as I’d expected, and there, in the corridor, was the sashimi ocean we’d been discussing earlier. Well, not really an ocean, just more of a large puddle. There was no sign of pipework or a leak in the immediate vicinity, so I wondered how it got there. Could it be a magic, sashimi-producing ocean? Could it be that a sake-swilling patron had leaked on the way to the loo? Perhaps someone had left their brolly there and it the water was its legacy. Whatever it was, it made me smile. Perhaps there really are secret basement oceans capable of producing dream sashimi. Sake – tut tut, wicked girls! We chose a sake for serving cold and asked the waitress if it was possible to serve it warm. Yes it was and there was no fuss about it or trying to upgrade us to a superior sake for serving warm. I don’t know enough about sake to score it but safe to say that it was perfectly drinkable with that lovely warm rush that’s so precious when you’ve just been drenched by a London downpour, as I had. Decor – don’t go here if you’re passionate about interiors, unless you want to see a well-seasoned Japanese tavern-style eatery. Upstairs is definitely better than down, and that’s saying something. Eating at the counter – 10/10 for entertainment value, relative comfort and the fisherman figurine. I think he’d be happy to come home with me and live with Blue Monkey. Staff – The waitresses get a score of 7/10 and the grill chef earns himself a 9/10 for being so friendly. Likeliness to return to Yoisho? 10/10 as in extremely likely. If I weren’t watching my pennies before Christmas, I’d teleport myself there right now. Those sashimi prawns are what dreams are made of. As a rule, I usually avoid food described as “vaguely blue” but your writing is so good, I think I might make an exception for these sashimi prawns. Pat – all I can say is those prawns were some of the best prawns I’ve ever eaten and in spite of being vaguely blue, no after effects except for thinking about how I’d love to have more. I wish I could send you some for Christmas. 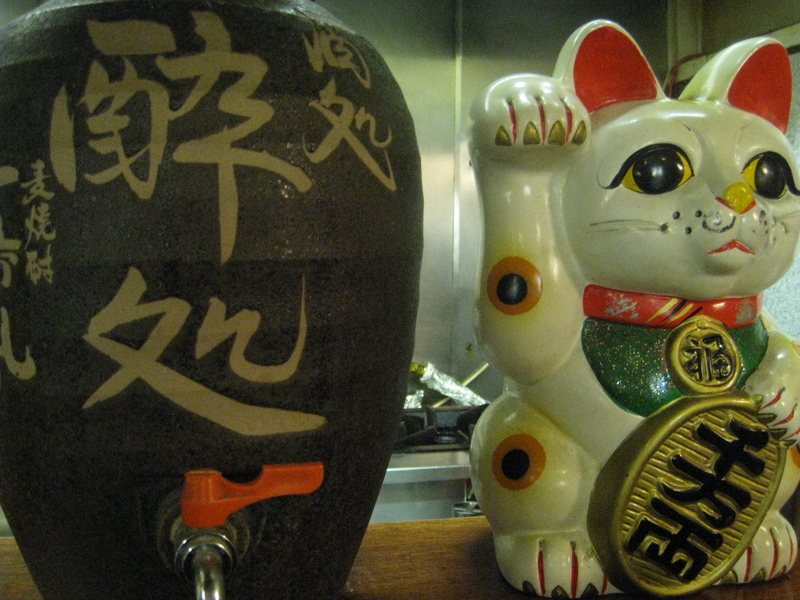 It’s not a Japanese restaurant without a maneki neko beckoning cat! Did the assorted chicken skewers contain ones entirely of: chicken skin, cartilage, and hearts? … those are the usual ones that come along with the chicken meat ball mulched type (tsukune) and the actual chicken meat ones (negima or momo). PR – love the cat but not the chicken skewers. Apart from one which was identifiably chicken, the others could well have contained other chicken bits and pieces… We couldn’t really say for sure which chicken parts they were, just that they weren’t very um er palatable so we just quit while we were ahead and enjoyed everything else on the counter. Razz – Gyoza awaaaay! Yes, my Danish pal told me that this was a tavern-style eatery, very authentic. I liked it a lot. Too much zen almost goes against zen, doesn’t it? Love the sound of those little smoked salmon puff pastry doo-dahs. Again, I wish we lived closer so we could pop around and sample some with a splash of fizz for Christmas. Enjoy the sun down there. It’s freeeeezing here! Sounds like it was pretty authentic to me, as many of the restaurants I went to in Japan (a few hundred) were pokey little dumps. Despite what we in the west think about that clean Japanese Zen style, in Japan it’s quite a bit more “relaxed” that what we see in the architectural magazines showing all the schmick stuff. By the way, my favourite sushi in tuna. Lately I’ve been eating a lot of smoked salmon on little squres of fuff pastry that have been smeared with advocado and wasabi whipped into a cream. It goes really well with tomato salad. So easy and yet so delicious! only another 25 minutes to go … over here. I hope it finds you healthy and happy if not wealthy and wise.